Martha was the first one to accept my #MetsMonday invitation. Thank you, Martha, for sharing about a topic we can all relate to – the patient/doctor relationship. Any such relationship needs to be one of mutual respect and partnership, but the relationship with your oncologist is like none other. Speaking as someone who has had five oncologists, I sure relate to Martha’s words and how she came to re-frame the relationship she has with her oncologist. I have a feeling you, my dear readers, will relate too. 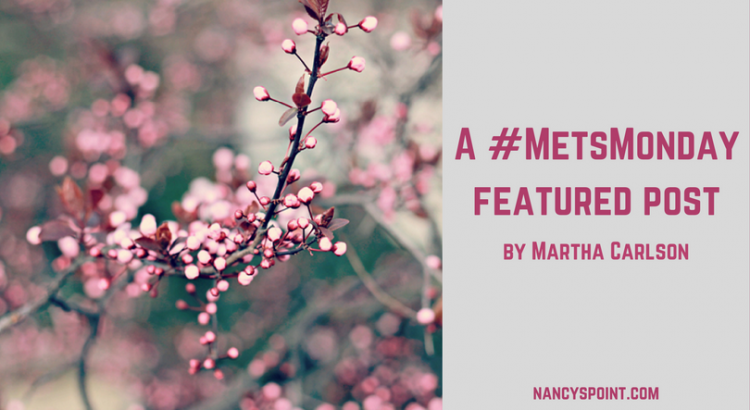 Be sure to share your thoughts at the end of Martha’s post. Nancy’s Point was one of the first blogs I came across in the early days of my diagnosis, and I continue to appreciate her point-blank attitude about living with cancer. She is honest when she writes, and that honesty can be a struggle when you want to talk openly about difficult topics yet long to protect those you love from pain in your life. That’s the truth. She’s a capital-T type A personality, who — I’ve seen this firsthand — can intimidate with a glance. And if she adds a sigh? Forget about it. It’s a personality I’m familiar with since my mom and both my sisters share that kind of mental power and focus. My closest friends do as well. These are not women with time to waste. Plus, there’s the little item of her saving my life. Still, I listen with longing when other women with metastatic cancer talk about their warm and easy-to-relate-to oncologists. They get hugs, reassurances, conversations about their families and vacations. I kinda want those things too. Mostly, I get hushed when she’s examining me. Nearly every stage IV patient I know has switched oncologists at least once. I dread the day when I must move on or my oncologist retires. For me, the relationship is just that, a three-year relationship with ups and downs and experiences I’ve had with only her. During the first six months, I saw her every week, then every three weeks, and now we’re up to every three months. A lot can happen in three months. As a reasonably informed patient, I don’t really need many things explained to me, but I do need to feel connected with my oncologist. I need to know that she thinks of me as a person and not just an illness she is treating. Our now infrequent visits, combined with the demands on her time, have resulted in a tenuous connection. She knows a lot about me, but I sometimes wonder if she knows the most important things. She knows how to keep me alive, but does she know what matters to me in that life? Even as I ask myself that question, I follow-up with, does it matter? I sometimes think that if my oncologist and I are in a relationship, it’s one that is unhealthy and one-sided. Yet, I don’t want to give her up. Maybe “relationship” is the wrong word to use when thinking of my doctor and me. When I think of her as my teammate, I can excuse a lot of things that would end a relationship. I want the best players on my team, and I’m pretty sure I’ve got a superstar here, so I want to be her best teammate too. I’m not big on excuses and justifications, but I can get the best experience out of my oncologist appointments by re-framing how I think of my doctor. If I take on the responsibility of being a good teammate, rather than expecting her to be a dream-doctor and demanding little of myself, then I can change the dynamic in a way that gives me what I need. I already know to get questions and issues to her ahead of appointments, and I have learned to get straight to the point as honestly and completely as I can. In this way, I can maximize my time with her. Since my kids all played sports where teamwork was important for success, I like the idea of thinking of my doctor in this way. It isn’t exactly a breakthrough for medical care, but it is a breakthrough for me. Because again, I don’t want to say goodbye to my oncologist. Friends may tell me that any doctor would have saved my life, but I don’t know if that is true. I don’t know that another doctor would have the mental gears turning in such a way to help give me a good quality of life for three years of metastatic disease or to be open to changing plans as we go along. Maybe next time, when I have the urge to talk while she feels under my arms, after all, I’ve only got a few minutes of her time, I’ll remember that her part on the team includes paying close attention to changes, and she does her best work when she’s not being distracted. Now I just have to work on making sure my teammate knows what I need to be the best player I can be. Look me in the eye when you ask how I’m doing. Electronic health records be damned. 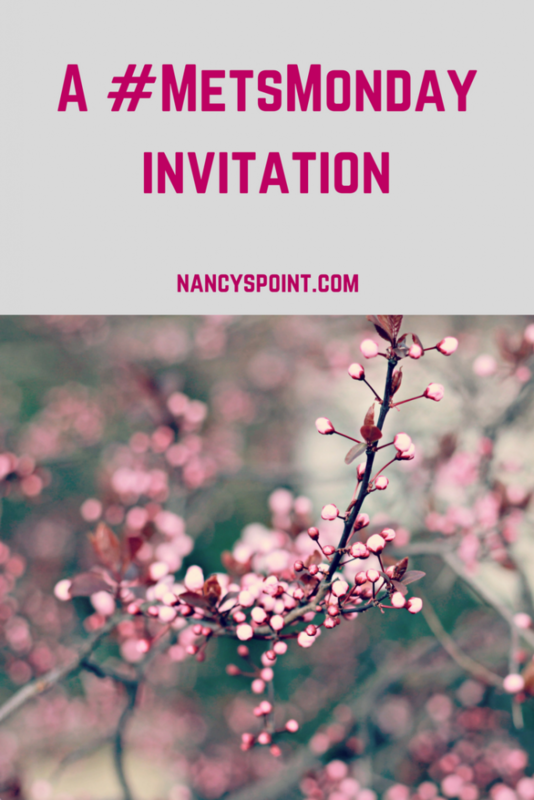 Sign up for weekly updates from Nancy’s Point! Keeping it real. Support you can use. Martha lives in Illinois, has three children, two in college and one a Freshman in high school. 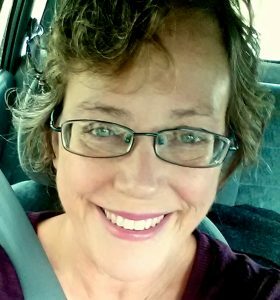 She has been living with HER2+ metastatic breast cancer for nearly 3 1/2 years. 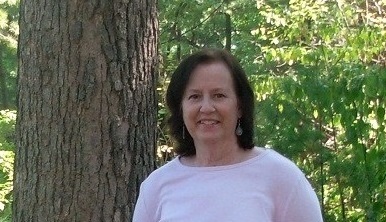 She writes regularly for Cure magazine’s online site at curetoday.com and believes in the power and necessity of patient advocacy in all its forms. How would you describe your relationship with your oncologist (or other doctors)? Do we sometimes expect too much from our doctors? Do you feel your doctor views you as a person and not just a disease to treat? Do you have a question for Martha? I’ve been with my oncologist now for almost ten years. Our appointments are very quick with little chit chat and a “you’re healthy, my dear” send off. I mean, it’s fine. Do I wish I could get more from her? Maybe. Do I want her laser focused when examining me for changes? Yes. I also defend her speedy visits with having bigger cases to worry about or patients who really need her and I try to feel grateful about that for my sake. Your post today has me thinking about an article I read recently about managers and employees and how employees are often disappointed in their managers. The reason is because employees expect so much from one person and it is impossible for that one person to be everything. Doctors simply cannot be everything we want them to be. So, I agree that we need a team and let our oncologists be a superstar at what they are best at and find other teammates to fill the positions we need filled. Best to you and thanks for sharing! My husband will sometimes remind me that a fast visit is good, saying “She’s not worried about you.” Thank you for reading and replying! Martha, I’m a physician and I had an oncologist who shared all about herself and missed some crucial issues with me. So, I switched to a male oncologist and our visits are brief and we don’t talk about personal things, but I trust that he’ll make the right clinical decisions. Those electronic records! I’m guilty of typing while I see patients, but I do try so hard never to turn my back and to always look at people. I teach medical students and we teach that self revelation has been proven to not benefit patients— it’s their visits, focus on them. Empathy is key, but if you can’t muster empathy, respect is crucial. The “full package “ of warmth and brilliance is rare, but her laser focus has served you well. Thank you for an honest and thoughtful post. Thank you Kira! I agree–that focus has served me well and I keep that in mind. I hope your current oncologist does as well for you. I tell my oncologist what I want out of treatment (quality of life over aggressive treatment) and then I remind her of those desires when she suggests treatments. My expectation of my oncologist? Respect my wishes, keep up on research, admit when you don’t know. Ugh. I really am not happy with my oncologist–I’m not even sure why I have appointments. It seems like all they consist of is his looking at my chart and telling me “everything looks good.” Then he usually asks if I have any questions or concerns, but there’s a mental “oh, crap! she does!” if I say I do. Yet I hesitate to look for another oncologist at this point, because I will soon by applying for SSDI, and having a doctor that will pretty much do whatever I ask in terms of paperwork, etc. might be a good thing to have. Plus, looking for a new oncologist is hard–how will I know I’m not jumping from the frying pan into the fire? I loved my first oncologist. I think we could’ve been great friends! She ended her practice here, moved to another state. I was in a deep funk when she left. Her replacement (because the hospital group she left gave us a new doctor)is a kind person, but she’s not as tough as the first doc. Second doc said, “I would not have treated you as aggressively as Dr. M did. But it seems to have worked.” Okay, so for the last month I’ve been doing tests, seeing other doctors because the cancer markers in my blood test were elevated. During that time I’ve wondered: What if she DOESN’T”T treat me aggressively? What if she treats me and it doesn’t work? I liked the aggressive approach of Dr. M (who had my diagnosis and treatment plan checked out by someone who is a well-noted cancer doctor who approved of my aggressive treatment). I need to change oncologists. I’m researching it. I don’t need a best friend, but I need to feel that my oncologist doesn’t think I can’t handle things. Linda, Switching doctors is hard. Switching oncologists is really hard as the relationship is so unique. I hope you find one that suits you well. Like you, I don’t need (or even want) mine to be a friend. Good luck with your search and thanks for sharing.